David asks Patric what the inspiration for Fishy Joe's was. Patric can't remember. He then jokingly asks Rich how the episode was drawn. Rich says with "a pencil of some sort". A few seconds later he says "oh I remember how it was drawn now!" David explains that the Molten Boron song says "Nobody doesn't like Molten Boron! ", but the singers recorded the line as "Nobody does it like Molten Boron!". 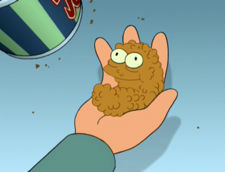 In editing, they took the "ten" sound from the end of the word "molten" and added it to "does", to make the version of the line used in the episode. Jokingly, David also says he earned 28¢ for the Molten Boron ad, which he claims he spent on a dictionary for Chris that has the word "doesn't" in it. Rich explains that the popplers are drawn so realistically because they have no black outline and there is shadow drawn on each one of them. Patric says he is still trying to remember what/who they named Fishy Joe after. He says he choose "Gilman" as his last name because fish have gills and Fishy Joe is a man, hence "Gilman". Matt asks what are popplers named after. The title of the episode is a homage to the Star Trek episode "The Trouble with Tribbles". The writer of that episode, David Gerrold, contacted David to make a comment on this episode. David says that Gerrold is a big fan of Futurama. Billy jokingly says Gerrold asked why they called them "popplers". This leads to them debating why they are indeed called popplers, with Patric saying the name has to do something with Fishy Joe. Patric says the fourth wall is broken when Leela crashes through the large screen from the opening sequence. It is mentioned how this episode won the Environmental Media Award. David says The Simpsons usually win it, but they stole it from them this time. Free Waterfall Jr. is voiced by one of Matt's radio heroes, Phil Hendrie. This episode was also nominated for a Genesis Award, given out by The Ark Trust, but did not win. Patric says an episode of the show Popular beat them, so he thinks people got confused between that and "poppler" when voting. Fry mentions eating parrots; Matt says they actually do eat parrots on this show and references the episode "Xmas Story". Chris says that Futurama is the first show to use Boobams in its music since shows from the 1950s. The show is also one of very few to use a real orchestra to compose its music. Matt sent away for a build-it-yourself Theremin, but it was too difficult to build. He then saw an article called "How to Build Your Own Theremin at Home and it Still Won't Work". Originally, Fry was the one who was going to be eaten by Lrrr, but David decided to change it to Leela whilst he was on a plane. The Extreme Walrus Juice jingle was composed by Chris playing guitar, bass and drums. Chris says bells are a strange instrument that people thought were "hip" at one point in time. Rich Moore: Why are they called popplers? Billy West: Because they're popular and you pop 'em in the mouth, you know the drill. Patric Verrone: I forget what beat us, it was an episode of a show called Popular, I think. And it lead me to believe that they had just made a mistake, people voting thought they were voting for the poppler episode. David Cohen: I think you're probably right! Matt Groening: I also think that uh, Jackass and, uh...oh, I'm sorry, not Jackass! Uh, the various Star Trek shows have I believe used full orchestras. Billy West: How do you know when there's a drummer at your door? The knock keeps speeding up. Matt Groening: This is a very rare scene in an American sitcom, where, a creature's in a woman's mouth who's in another alien's mouth. Christopher Tyng: Didn't that happen on Friends, just last week? This page was last edited on 30 July 2014, at 20:22.